I am a Professor of Agronomy at Purdue University with major responsibilities for Extension education in corn management systems for the state of Indiana. 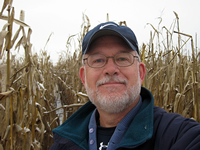 Originally from Nebraska, I joined the Agronomy staff at Purdue in 1982 after obtaining M.S. and Ph.D. degrees from the University of Minnesota. I am actively involved with Purdue’s Crop Diagnostic Training Center, a hands-on educational facility located at the Purdue Agronomy Farm. One of my major Extension activities is the development and maintenance of Web-based corn information sites. My two most popular Web sites are the Corn Growers' Guidebook (http://www.kingcorn.org) and the Chat ‘n Chew Café (http://www.kingcorn.org/cafe). My current field research involves investigations into the relationship between crop canopy reflectance and optimum nitrogen fertilizer rates in corn, on-farm seeding rate trials, on-farm nitrogen rate trials, and the productive utilization of site-specific crop management tools. Extension education in corn management systems. Publications that are not available online may be ordered through "The Education Store" at Purdue. The online version is a very large PDF file (22MB). Most of the Extension information I publish is in the form of online news articles and can be found in the Corny News Network Archives. Research interests in corn management systems. I have converted some of my online Powerpoint® presentations to Adobe® Flash® versions that should be less memory-intensive to download and play. They require Adobe's Flash Player which is a standard add-on to most of today's Web browsers. If you need to download and install the Flash Player, go to the Adobe download site at http://get.adobe.com/flashplayer. A written summary of a presentation developed for the 2012 New Zealand Maize Conference, Hamilton, NZ, Feb 2012. Sponsored by the Foundation for Arable Research, Lincoln, NZ. A recording of a presentation made by yours truly at the 2011 American Society of Agronomy Annual Meeting, San Antonio, TX. This presentation was part of a symposium organized by the ASA titled "Advancing Agronomy Through Public-Private Collaboration". Abstract: Federal, state, and county funding support for the overall Cooperative Extension effort continues to erode and certainly begs the question about the sustainability of our capacity to provide independent, research-based agronomic information to farmers in the U.S. Results from numerous grower surveys lead some to further question whether agronomic Extension will be necessary in the future given the ever-increasing reliance by growers upon the agronomic advice and recommendations provided by agri-businesses and private consultants. Beyond the question of fiscal sustainability for Extension, there is the equally if not more important philosophical question whether farmers' agronomic needs are best served by a healthy combination of public and private efforts in agronomic research and education. This presentation shares my thoughts and opinions about row spacing and plant population decisions for corn. The presentation was developed for the Illinois Ag Masters Conference, Dec 2010. A PDF summary of the presentation slides is also available on-line at http://www.kingcorn.org/talks/2011_RowSpacing&Pop.pdf. This presentation discusses the practical ins and outs of conducting your own on-farm research. A written summary of this presentation is also available on-line at http://www.kingcorn.org/news/timeless/OnFarmResearch.pdf. This presentation shares my thoughts and opinions about the calibration of yield monitors. A brief summary about yield monitor calibration is also available on-line at http://www.kingcorn.org/news/timeless/YldMonCalibr.html. This presentation shares my thoughts and opinions about the challenges and rewards of choosing hybrids wisely. This presentation highlights our research with optical reflectance sensors and their potential for helping fine-tune nitrogen rate decisions for corn. Corn Planter Tuneups: Why Bother? A presentation on the importance of uniform plant-to-plant spacing and emergence in corn, plus guidelines on improving planter performance.. This presentation discusses the issues and challenges of achieving successfull stand establishment in no-till corn. Suggested agronomic decisions for improving stand establishment are described. Certain transgenic corn traits available to U.S. corn growers are not yet fully approved in the global marketplace, especially by the European Union. Consequently, certain U.S. grain buyers restrict their purchases to that from only approved hybrids and reject grain from non-approved hybrids or grain from fields of approved hybrids that is "contaminated" with transgenic grain. This so-called "contamination" can occur from mechanical mixing (commingling) of grain from different hybrids during planting, harvesting, or post-harvest operations. Pollen drift from transgenic hybrids can also cause "contamination" of neighboring fields due to cross-pollination. Consequently, growers who desire to maintain the non-transgenic purity of the grain in their production fields need to understand corn pollen biology, the dynamics of pollen drift, and possible methodologies for minimizing the risk of significant pollen "contamination" from adjacent fields of non-approved corn hybrids. Adobe Acrobat formatted summaries of a presentation made at the 5th Australian Maize Conference, held 18-20 Feb, 2003, in Toowoomba, QLD. Adobe Acrobat formatted summaries of a presentation made at the FAR New Zealand Maize Conference, held 12-13 Feb, 2003, in Hamilton, New Zealand. Maize GE  Benefits & Bugbears in the U.S.
Timeless ideas and suggestions for improving agronomic efficiencies, and thus profitability, of corn production in Indiana. Many post-emergence herbicide labels restrict the size or age of corn that can be treated. This Adobe Acrobat formatted version summarizes a presentation made at the 2003 Southwest Indiana Corn and Soybean Day held in Vanderburgh County, Indiana, on 10 January 2003 that offers insight into the uncertainties of determining corn growth stages relative to herbicide usage. This presentation shares my experiences in the art of crop diagnostics, including what questions to ask, how to look at a field, how to resist the know-it-alls, how to locate that missing puzzle piece, how to sneak away from the crowd, how to stick your foot in your mouth, and how to hem and haw with the best of them. I also share some experiences with photography, including digital imagery, from the perspective of capturing these precious moments in crop diagnostics. This Adobe Acrobat document summarizes a presentation given at the 2002 Nebraska Independent Crop Consultant Association Spring Workshop and revised for the 2002 Mid-Atlantic Crop Management School in Maryland. Stalk rots and accompanying root & stalk lodging in corn can be devastating in their effects on yield and harvest losses. This Adobe Acrobat document summarizes a presentation given at a grower conference in southern Indiana in November 2001. An online version of a talk presented at the 2000 Purdue Top Farmer Crop Workshop that emphasizes the importance of dense data sets for interpolating spatial variability for yield influencing factors. An on-line slide presentation of issues relevant to the potential for improving yields with Precision Farming technology. Adapted from a presentation given at the VI National Corn Congress, Pergamino ARGENTINA, 12 - 14 Nov 1997. The Congreso Nacional de Maíz was organized by the Asociación de Ingenieros Agrónomos de la Zona Norte de la Pcia. de Bs. As. (AIANBA). Raised on farm in southeast Nebraska near Springfield. Graduated from Springfield-Platteview High School of South Sarpy County School District #46.